This topic provides detailed information on installing ReadyAPI. Binary installers are available for Windows, Linux, and macOS. To learn how to install VirtServer, see VirtServer Installation. To learn how to install ReadyAPI on linux headless machines, see Installing ReadyAPI on Headless Machines. To run ReadyAPI, your computer must meet certain system requirements. Also, you will need either a ReadyAPI trial license or a commercial Pro license for one or for all ReadyAPI applications (SoapUI, LoadUI, Secure, ServiceV). A Pro license for one of the application enables basic functionality of the other ones. ReadyAPI will ask you to activate your license when you run the product for the first time. If you have an active license of ReadyAPI, you do not need to activate a new license. VirtServer requires a separate license. Download the installer for your platform from the ReadyAPI Downloads Center. You can also download the installer via ReadyAPI Updater. Click Download in the New Version Check dialog. Specify the download location and click Next. Select either Yes, execute the update installer now or No, I will execute the update installer later and click Finish. Note: If you select to execute the installer later, the steps in the Installation Wizard may differ. Tip: Click to see where the current installation is located. 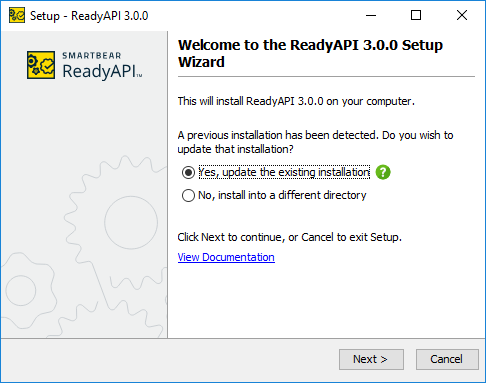 If you downloaded the installer via ReadyAPI Updater and selected to run it later, click Next in the Wizard. Select the needed option and click Next. Note: This topic explains how to install the product for the first time. If you update your current installation, the steps may be different. 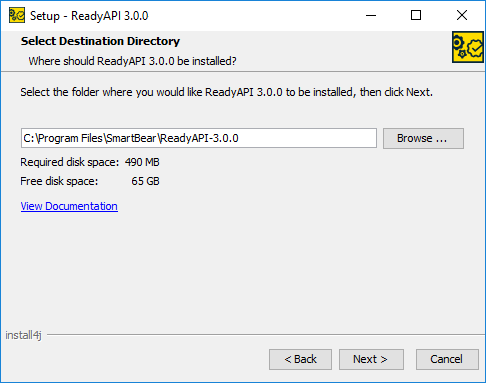 Full installation – installs the default set of ReadyAPI components to the default folder. Custom installation – allows you to select the components you want to install and specify a different installation folder. ReadyAPI comes bundled with extra components that you may want to install if you need them. The components can also be added later by running the installer again. JDBC Drivers The JDBC drivers are needed to connect to databases. If you need some other JDBC drivers, you need to install them manually. Note: Click to get more information about a component. If you use Linux, on the next page, you can create symlinks. To do this, select the Create symlinks option and specify a directory. 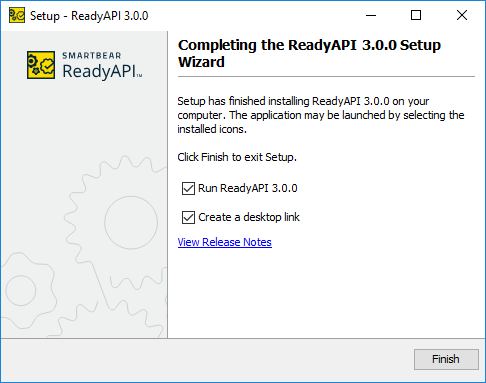 When the installation is complete, you can select the Run ReadyAPI check box to run ReadyAPI upon closing the wizard.